Hazel Atlas jam jars were part of a promotion used to advertise the new Kix cereal in the late 1930’s and early 1940’s. I have found magazine and newspaper ads… also radio commercials… from this time period advertising this promotion of “English breakfast marmalade jars”… one strawberry or one apple for one cent with the purchase of two packages of Kix cereal. 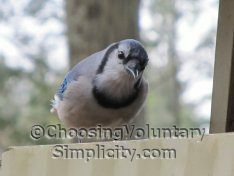 (Kix cereal prices varied slightly from store to store, but two packages of cereal always cost less than 25 cents.) 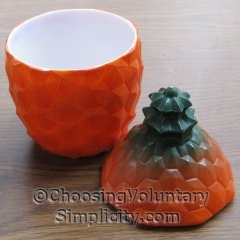 I have not been able to find a similar promotional advertisement for the pineapple… if you know of one, please let me know. 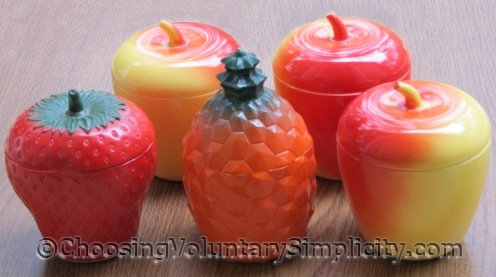 The strawberry and apple are still often available, but the pineapple is considered to be a rare find. 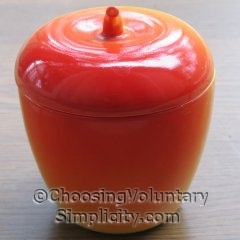 It has only recently been acknowledged as one of these promotional jam jars and is several times more expensive than the other two. It isn’t as noticeable in photographs, but the pineapple has a much more delicate appearance than the more bulky strawberry and apple. 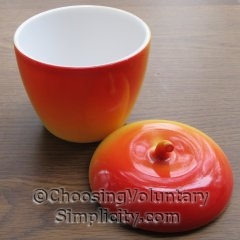 The apples can vary quite a bit in coloration, but each one is a blend of red and yellow. Some people insist the apple was actually intended to be a peach, but all of the vintage promotional material I have found describes it as an apple… and it certainly looks more like an apple to me! None of these three promotional jars have a manufacturer’s mark, but it is the consensus among the experts in this field that they were all made by the Hazel Atlas Glass Company. The jars are made of a white milk glass… probably the patented Hazel Atlas platonite… with a fired-on paint finish. 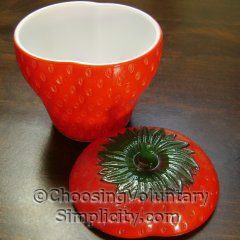 On some of the strawberry jars the green leaves were originally painted rather unevenly. This is a common (acceptable) characteristic, but I have seen several strawberries recently where the leaves had unfortunately been repainted with a high gloss green paint. I have occasionally also seen repainted apples, but in both cases the repainted finishes are very different from the original fired-on paint… it’s easy to tell the difference. Obviously repainted jars should be avoided. 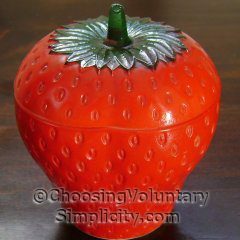 As far back as I can remember, my mother always had one of the strawberry jars on a shelf in the kitchen. I remember that she used it to store safety pins. Several years ago she found an identical jar at a yard sale and bought it for me because she knew how much I had always liked hers. These two strawberries were my introduction to Hazel Atlas jam jars. 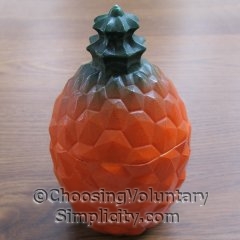 More recently my sons have expanded my collection, and their gift to me this past Mother’s Day was really special and a huge surprise… an absolutely perfect Hazel Atlas pineapple!!! What a charming and delightful collection. I really enjoyed reading about these whimsical little jars, their history, and how you first learned about them. And how thoughtful of your sons to surprise you with the pineapple jar – that part of your story really made me smile. I appreciate the detail you put in your posts. I have been looking for information about these jars. My nana had the apple but we never knew it was Hazel Atlas. I’ll have to see if she still has it somewhere and if she’ll let me have it. Don’t you wish companies gave away things like that now? I can remember getting towels and wash cloths in soap powder and pretty glasses in soap powder. And that was when I was in my teens in the late 60s early 70s. These are beautiful. How nice that you have a pineapple too. What a lovely collection! I have never seen any of these in the antique stores in my area (East Texas). I have read that some collectibles seem to be more regional finds. I wonder if that is the case with these? I actually have 2 of the apples. I bought one for myself and one for my mom some years back. When my mom passed away, I got her apple back. I have seen numerous strawberries in my hunting, but have not seen a pineapple! I didn’t know the strawberries and apples were related as they are. I am so happy to know the history of these!